Managua (Agenzia Fides) - The Archbishop of Managua, Cardinal Leopoldo Brenes, yesterday declared after the celebration of the Mass for the feast of St. Joseph, that he supports the participation of the Apostolic Nuncio, Archbishop Waldemar Stanislaw Sommertag, as an accompanying witness at the negotiating table between the government and the Civic Alliance. "I think the Nuncio is playing a very nice role, because he said he is keeping the door open to dialogue with the government, and I think he is doing it", the Cardinal said. Therefore Cardinal Brenes, who is President of the Episcopal Conference, publicly thanked Mgr. 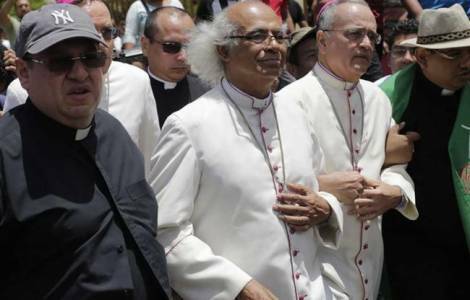 Sommertag for his participation as a Vatican envoy and sole representative of the Catholic Church in the talks, after the Nicaraguan Bishops' Conference declined to participate (see Fides 09/03/2019). The Cardinal's statements come after the impromptu press conference on Monday 18, at the door of the Nunciature, during which the Apostolic Nuncio stated that having an open communication channel with the government does not mean that "one is on one side". Sommertag complained the fact that in Nicaragua "there is no trust, there are many lies", therefore he stressed: "I have no leaders or patrons, neither left nor right, nor behind nor in front". With these statements, the Nuncio reacted to the various criticisms expressed about his action as a mediator and witness in the negotiations. The Nuncio continued: "I am not neutral, I cannot be neutral in the face of the suffering of a people. But I am impartial. Yes. I am honest and speak directly. I speak to people with facts "That is why some are speaking ill of the Nuncio, because he says things in the face and does not lie. If you (journalists) want, we can meet here every day, if you have doubts about the work of the Nuncio", he added. "Unfortunately, some media are setting a trap, so that we cannot negotiate, I think there should be some caution", he concluded.